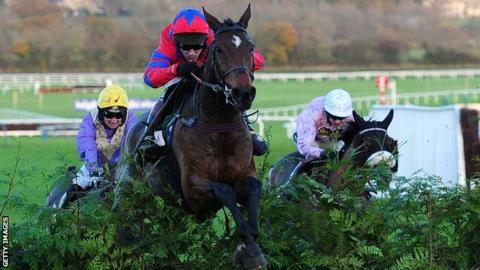 Balthazar King is making "steady progress" after breaking his ribs in a fall at the Canal Turn in Saturday's Grand National. The 11-year-old started as one of the favourites, but only made it to the eighth fence. Trainer Philip Hobbs said on Monday: "Balthazar King has had a good 24 hours. He is very sore but is eating and seems bright in himself." The horse, ridden by Richard Johnson, was runner-up in last year's race. Ballycasey's jockey Ruby Walsh, unseated in the same incident, waved the chequered flag to direct the field around the incident at Aintree, as Many Clouds went on to give jockey Leighton Aspell his second straight win in the race. Walsh, a two-time winner of the National, took the flag to warn the field to go wide of the fence on the second circuit as vets tended to the stricken horse. He received treatment from a vet on the Aintree track for at least an hour before being taken to the Liverpool Equine Hospital. Meanwhile, jockey Davy Condon escaped serious injury after suffering concussion in a fall from Portrait King three fences from the finish. Condon was the only one of the 39 riders who required medical attention and he was transported, conscious, to Aintree Hospital where he was kept in overnight as a precaution. Trainer Maurice Phelan said: "He was fully awake and talking, but they wanted to give him a scan just in case and thankfully it's come back clear. "He has concussion, but everything is fine. The horse is fine."